This website previously hosted the blog and schedule for a digital history “masterclass” taught in AY 2012-2013. You can still find the old schedule. This page now contains the syllabus for HIST 318: Digital History Methods, offered in Spring 2014 at Rice University. You can download a PDF syllabus, or jump directly to the Schedule, Assignments, or Course Policies. This hands-on, project-based course introduces students to the use of digital tools and sources to conduct original historical research, analyze or interpret findings, and communicate results. In order to focus our efforts, we will apply what we learn to a particular area of historical study: the history of nineteenth-century runaway slave advertisements and slavery in Texas. Working in partial collaboration with each other and with students in a similar, concurrent course at the University of North Texas, students also produce a final, open-web project that illustrates the promise and limits of digital methods to the study of the pre-digital past. Gain an introductory technical knowledge of many digital tools or methods that can be useful to historians (such as dynamic mapping, social network analysis, topic modeling, and HTML publishing) and an in-depth knowledge of one or two. Read existing scholarship on a contested historical subject and formulate historiographical questions of their own. Learn to apply technical knowledge about digital history tools to a substantive and complex historical question about the history of slavery. Help to make a public-facing digital project that illustrates the promise and/or limitations of digital history methods. Acquire experience managing a team-based digital humanities project. Evaluate the strengths and weaknesses of different examples of digital scholarship, including work produced in the class. Finally, much of your work for this course will be done “in public” on our course blog or websites like Twitter; while your grades are always private, some of your work will be shared with students elsewhere and with the public at large. At particular points in the semester we will be sharing results with a similar class being offered concurrently at the University of North Texas. All of these aspects of this course are actually not that new or rare at Rice. In fact, all of them are characteristic of popular undergraduate courses like ENGI 120 or COMP 160. What may be unfamiliar to you is doing these things in a humanities course, where our emphasis is usually on individual and private reading, writing, and discussion. But whether they are unfamiliar or not, these aspects of the class mean that every student’s engagement and participation will be essential to its success. By the end you’ll have sharpened your skills as an historian while also acquiring digital, teamwork, and project management skills that will be useful even beyond the study of history. Most of our readings for the semester will be available online or in OWL-Space. There is only one required book. The book is available in the campus bookstore. Fondren Library also has an electronic edition of the book if you would prefer to read it in your browser. In the first third of the semester, you will be introduced to some of the general problems and benefits of digitizing primary sources, while also learning about historiographical debates about runaway slave advertisements and the history of slavery in Texas. By the end of this phase of the class, we will have a growing set of digitized primary sources, a list of historiographically significant questions that we can ask about them, and an elementary knowledge of things like JSON, HTML markup, WordPress, and topic modeling. In the second part of the class, which concludes around Spring Break, you will work as part of a smaller group to become the class’s resident experts on a particular digital history method. After completing tutorials about this method and examining cases of its use “in the wild,” you will present what you have learned to the class and also propose your ideas about whether or how the method might help us answer our historical questions about slavery and runaway ads. The final third of the class is intentionally less finished than the first two, because after your presentations, we will collectively make a plan about how to spend the last weeks of the semester. This plan will require us to create, by semester’s end, a working prototype on the open web that shows how a particular digital tool does (or does not) help us to answer historical questions. Your responsibilities on this project will be determined partly by me and partly by other members of the class, who will also be asked to give me and you meaningful feedback about your work for the project. Course introduction. You should complete the online survey of digital skills after class. Discussion of sample runaway slave ads. Due Date for Homework #1, which must be complete by the end of the class. 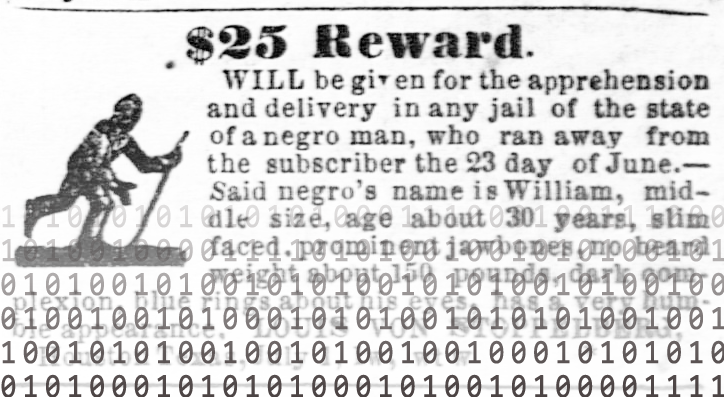 Discussion of fugitive slave ads collected from the Portal to Texas History. Special guest Andrew Johnson, a Ph.D student in the history department, will join us to talk about his own runaway slave ad project focusing on colonial South Carolina. Due Date for Homework #2, which must be complete by the end of the class. Due Date for Homework #3, which must be complete by the end of the class. Due Date for Homework #4, which is due before class. Randolph Campbell, An Empire for Slavery, Chapter 9, available on OWL-Space. Sarah Cornell, “Citizens of Nowhere: Fugitive Slaves and Free African Americans in Mexico, 1833-1857,” Journal of American History 100, no. 2 (2013), 351-374. William Dean Carrigan, “Slavery on the Frontier: The Peculiar Institution in Central Texas,” Slavery and Abolition 20, no. 2 (1999), 63-96. During these weeks, you will be assigned to work with at least one other student on some tutorials about a specific digital “tool.” Your task will be to understand the tool well enough to explain its capabilities to fellow students who are working through tutorials about other tools. On February 26 and 28, you will be presenting on this tool to the class as a whole and will need to report on whether you think the tool or method could help us answer (or better communicate the answer to) one or more of our questions about fugitive slave ads. Due Date for Homework #5, which is due before class. One on one meetings with me in lieu of class. Small group presentations on digital tools. Discussion of post-break project possibilities. The schedule for this last third of the class will be determined based on project planning decisions that we will make as a class in Week 9. You will be assigned to work as part of a small group on some phase of our final project. Progress Reports will be due from your group every Monday beginning March 17 and continuing through April 14. A longer, final report—whose objectives will be determined partly by the details of our project—will be due by 5 p.m. on May 7. Further assignments and deadlines will be posted on the course blog. Details about your assignments will be distributed on the course blog and tailored partly to the issues and questions that come up in class. Below is a breakdown of what to expect. I will assign points to these assignments when evaluating them; the total possible points are given in parentheses. As indicated above on the schedule, you will have five homework assignments, each worth 10 points. Each homework assignment will have both a technical and non-technical dimension, so that you will pick up the habit of using digital tools and thinking programmatically while also advancing our objectives as historians. Help will be provided for the technical portions, but you also may have to locate your own resources in order to complete the assignments. You will be allowed to revise and resubmit one of the homeworks within 24 hours of the deadline; the grade for the revised homework will replace the existing grade for that homework. In Weeks 6 and 7, you will work with other classmates to complete some tutorials on using a particular digital tool and will then give a presentation to the class about that tool. I will assign the tool and the tutorial, and details will be distributed in class. As also indicated above on the schedule, after Spring Break you will be part of smaller groups assigned to complete part of our final project. Your group must write a progress report each week about your work together. Depending on the size of the group, some of the progress reports may only be written by a subset of the group, with more individual points given for the reports that you help to author; more details about these reports will be distributed once groups and tasks are set. Your group will be allowed to revise and resubmit one of the progress reports within 24 hours of the deadline; the grade for the revised homework will replace the existing grade for that homework. Formal evaluation of your work on teams will be handled by me and a program called CATME. Three Two times during the semester, you will complete a survey about your own team participation and that of other members of the class. I will use these results, together with my own observations of your participation, to assign you three scores (maximum 10 points each) for your teamwork. The final decision on grades always remains with me, but I will also take into account how seriously your responsibility to evaluate your classmates and yourself fairly. Your final report, details of which will be determined in part by our class project, will be an essay that critically evaluates the prototype that we have built in the last few weeks of the semester. Your essay will assign and defend a “grade” of up to 30 points for our project, explaining the reasoning behind your evaluation. I will, in turn, assign a grade to your report of up to 30 points, based on how well you defend and explain your assessment of the project. The final grade for this assignment will be determined by averaging together my grade of your report with your grade of the final project. Because this class will require so much hands-on work, class attendance is mandatory. Repeated absences will be detrimental to your grade for team participation. To quote Highlander, “There can be only one.” After that, late work will not be accepted. Please contact me as soon as you know that an assignment will be turned in late. Exceptions to this policy may (very rarely) be made, but only when there are extenuating circumstances such as a personal emergency or an illness requiring professional medical attention. These circumstances must be documented to my satisfaction and brought to my attention before the deadline for an assignment arrives. If you have a documented disability that will impact your work in this class, please contact one of the instructors during the first two weeks of the semester to discuss accommodations confidentially. You will also need to contact and register with the Disability Support Services Office in the Allen Center. Because there will be collaborative and technical work in this class, there will be times when you are not only allowed but actively encouraged to seek out help from other students and online resources. Nonetheless, representing someone else’s work as your own is never okay. The guidelines for what you are allowed to do when collaborating will be made very clear for each assignment, and you will always be required to include acknowledgements of help you received. Your final grade will be calculated according to this table. Important Note: I reserve the right (but am under no obligation) to raise a final grade if your work has shown marked improvement over the course of the semester.